Robert Lee Frost was an American poet. His work was initially published in England before it was published in America. He is highly regarded for his realistic depictions of rural life and his command of American colloquial speech. His work frequently employed settings from rural life in New England in the early twentieth century, using them to examine complex social and philosophical themes. One of the most popular and critically respected American poets of the twentieth century, Frost was honored frequently during his lifetime, receiving four Pulitzer Prizes for Poetry. He became one of America's rare "public literary figures, almost an artistic institution." He was awarded the Congressional Gold Medal in 1960 for his poetical works. On July 22, 1961, Rober Frost was named Poet laureate of Vermont. Robert Frost was born on March 26, 1874 in San Francisco, California. He spent the first 11 years of his life there, until his father, William Prescott Frost Jr., died of tuberculosis. Following his father's passing, Frost moved with his mother and sister Jeanie to the town of Lawrence, Massachusetts. They moved in with his grandparents, and Frost attended Lawrence High School, where he met his future love and wife, Elinor White, his co-valedictorian. In 1894 he sold his first poem, "My Butterfly. An Elegy" (published in the November 8, 1894, edition of the New York Independent) for $15 ($409 today). Proud of his accomplishment, he proposed marriage to Elinor Miriam White, but she demurred, wanting to finish college before they married. Frost then went on an excursion to the Great Dismal Swamp in Virginia and asked Elinor again upon his return. Having graduated, she agreed, and they were married at Lawrence, Massachusetts on December 19, 1895. 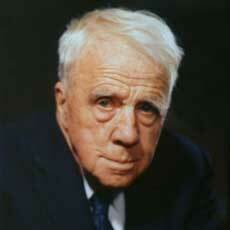 Robert Frost attended Harvard University from 1897 to 1899, but he left voluntarily due to illness. In 1912, Frost and Elinor decided to sell the farm in New Hampshire and move the family to England, where more publishers would be willing to take a chance on new poets, they believed. Within just a few months, Frost, now 38, found a publisher who would publish his first book of poems, A Boy’s Will, followed by North of Boston a year later. It was at this time that Frost met Ezra Pound and Edward Thomas, two men who would affect his life in significant ways. Pound and Thomas were the first to review his work in a favorable light, as well as provide significant encouragement. Frost credited Thomas's long walks over the English landscape as the inspiration for one of his most famous poems, "The Road Not Taken." Apparently, Thomas's indecision and regret regarding what path to take inspired Frost's work. The time Robert Frost spent in England was one of the most significant periods in his life, but it was short-lived. WWI broke out in 1914, and Frost and Elinor returned to America early in 1915. When Frost arrived back home, his reputation had preceded him, and he was well-received by the publishing world. In 1916, Frost and Elinor settled down on a farm that they purchased in Franconia, New Hampshire. There, Frost began a long career as a teacher at several colleges, reciting poetry to eager crowds and writing all the while. He taught at Dartmouth and the University of Michigan at various times, but his longest stint was at Amherst College, where he taught on and off for significant periods for more than 45 years, and where the main library is now named in his honor. He also spent almost every summer and fall at Middlebury College, teaching English on its campus in Ripton, Vermont. Although he never graduated from college, Frost received over 40 honorary degrees, including ones from Princeton, Oxford and Cambridge universities, and was the only person to receive two honorary degrees from Dartmouth College. During his lifetime, the Robert Frost Middle School in Fairfax, Virginia, the Robert L. Frost School in Lawrence, Massachusetts, and the main library of Amherst College were named after him. In 1960, was awarded a United States Congressional Gold Medal, "In recognition of his poetry, which has enriched the culture of the United States and the philosophy of the world," which was finally bestowed by President Kennedy in March 1962. Frost was 86 when he read his well-known poem "The Gift Outright" at the inauguration of President John F. Kennedy on January 20, 1961. He died in Boston two years later, on January 29, 1963, of complications from prostate surgery.